In many other countries, the alcohol beverage industry has fallen victim to the infiltration of counterfeit and poisonous products. News stories from countries around the world describe people being injured and even dying after consuming tainted alcohol. This problem is not exclusive to developing countries. Counterfeit alcohol is an issue in developed countries such as England and Finland as well. Why has this problem that spans the globe not become an issue in the U.S.? It is not because bootleggers and counterfeiters don’t try to expand their black market operations. 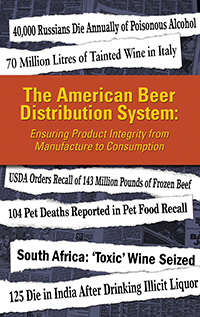 The U.S. does not have a problem with counterfeit and poisonous alcohol because it has a time-tested, regulated and transparent system in place for alcohol distribution that works to protect consumers.